After winning nine of their last ten games, baseball looks to finish the season with a three game series against Case Western. Fourth-year Ricardo Fernandez on the mound in a previous game. 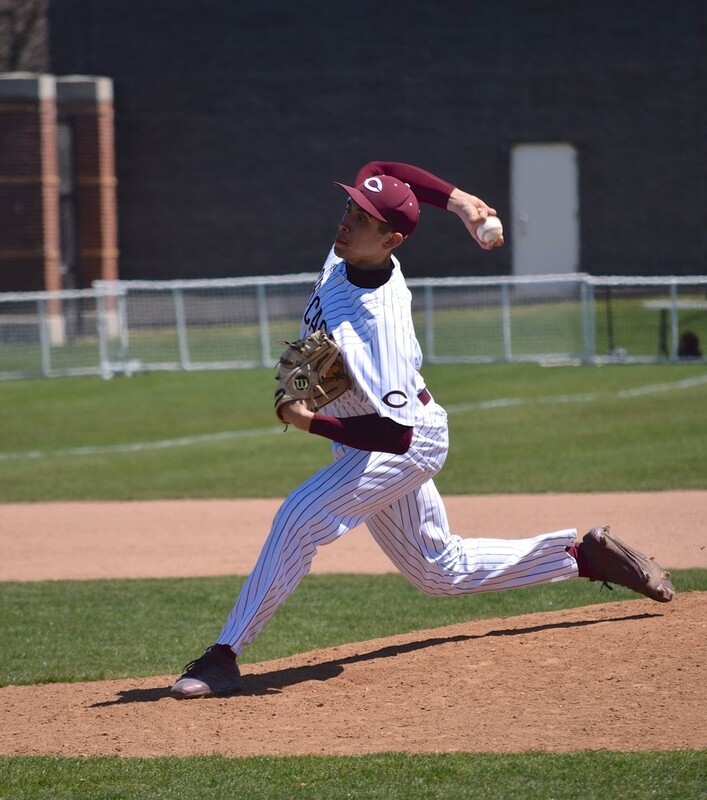 In the final games of their 2018 season, the UChicago baseball team will be heading to Case Western this weekend for a three-game series. The series will consist of a doubleheader on Saturday, May 12, and a single game on Sunday. The Maroons will be coming into this series after a red-hot performance last weekend in Grinnell, Iowa, where they blanked Luther and then went on to sweep Grinnell College in a three-game series. The pitching staff had a particularly great weekend, as in the Luther game, third-year ace Brenton Villasenor recorded the first shutout of his collegiate career, striking out eight batters in seven innings and allowing only four hits, lowering his ERA to only 3.10 for the season. First-year reliever David Clarke also recorded his seventh save of the season and broke the program record for season saves previously held by William Katzka (A.B. ’15). The offense also broke out for a total of 45 runs over the course of four games, with 19 coming in the last game alone thanks to ten runs scored in the sixth. With their performance in Grinnell, the team has tied their record for highest number of wins in a single season. With this, the Maroons are well prepared to take on Case Western, who are among their toughest opponents yet; indeed, the Spartans’ winning percentage is identical to that of the Maroons, with 26 wins and 10 losses. The Maroons traveled to Case Western last year for a four-game series but were ultimately swept by their hosts. Needless to say, the team is looking to avoid that fate and turn the tables this year. These games are also a milestone for the team in a different way, as it will be the last series that they will be playing while unaffiliated with a conference, which has been the case since 1997. The Midwest Conference, consisting of nine schools in Illinois, Iowa and Wisconsin, announced in December 2017 that UChicago baseball will begin competing as an affiliate member starting in spring 2019. The Maroon baseball team joins the football team, who entered the conference in fall 2017. The team’s independent status has made it difficult for them to get a bid to the postseason tournament, despite their success, but they will likely have a much better chance next year. The Maroons’ next and final set of games will be a tripleheader at Case Western in Cleveland, Ohio. The first game will be on Saturday, May 12 at 12 p.m., the second game will be on the same day at 3 p.m., and the last game will be the next day at 12 p.m.